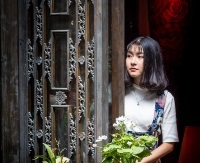 Kuanzhai Ancient Street is one of three historic preservation areas in the city and scores highly on most visitors' lists of things to see and do in Chengdu. It is formed by the confluence of three alleys: Kuan Alley, Zhai Alley and Jing Alley. The area once boasted 45 Qing Dynasty (18th-century) courtyards, and Kuanzhai contains the only three which remain well-preserved. Kuanzhai is now trendy and artistic and is an entertaining cultural experience for visitors, with ancient Chinese architecture contrasting with modern restaurants and art galleries in a captivating way. It is particularly interesting to walk this street in the evening when the ancient attractions are juxtaposed with a lively modern nightlife and bright city lights. There are lots of souvenir shops and craft stalls selling ceramics, silk and embroidery. There are also a number of restaurants, pubs and food vendors to sell you a variety of local cuisine; and places like Starbucks to provide international staples. Another good reason to visit Kuanzhai in the late afternoon or evening is the entertainment provided by cultural displays, dancing groups, and locals doing their daily aerobics. The area is intended to be a cultural hot spot and often even the walls display photo exhibitions. Kuanzhai is a great casual tourist attraction in Chengdu, a place where you can wander freely and just absorb local flavour. Address: East of Tongren Road and West of Changshun Street, Qingyang District.